Summary: Jojo Moyes meets Eleanor Oliphant in Goodbye, Paris, an utterly charming novel that proves that sometimes you have to break your heart to make it whole. 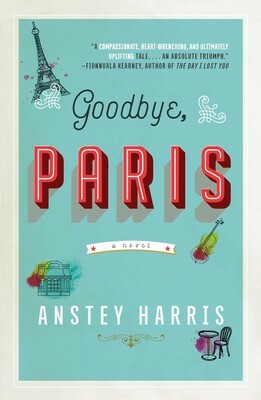 Both my college-age daughter and I read GOODBYE, PARIS by Anstey Harris, and not surprisingly, we had different opinions of this novel. I enjoyed it quite a bit thought it was a heartwarming story, while my daughter thought it was just okay... and very predictable! I'm sure there are readers who will agree with each of us. Grace eventually realizes the bitter truth about David, and it sends her reeling. However, with the help of her friends, Grace discovers that she's much stronger than she ever thought; and she even manages to overcome her past fears and truly blossom! I found GOODBYE, PARIS to be a charming book that definitely warmed my heart. I loved Grace (even though she was a little obtuse at times), and I really appreciated her friendship with Mr. Williams and Nadia. I will admit that the book was a little predictable, but that didn't bother me at all. I especially enjoyed seeing how Grace bounced back despite numerous setbacks. In addition to the great characters, I really was impressed with Ms. Harris' writing. Her character development was delightful, and her prose was beautiful. I loved how she revealed Grace's troubled past and the way she showed how Grace overcame this. It really was a story about redemption and second chances, and who doesn't love a story with those messages? GOODBYE, PARIS would make a great book club selection. The story is guaranteed to entertain, but I also think there's plenty to discuss about Grace. She makes some very questionable choices that are certain to stimulate discussion. In addition, there are also some serious topics which many readers will want to talk about. Some of the themes you might want to discuss include loss, fear, forgiveness, second chances, and anxiety. Check out the reading guide for more topics. I definitely enjoyed GOODBYE, PARIS and highly recommend it to fans of charming stories about women and friendship. I love that you and Booking Daughter read this. Sometimes charming and predictable is just what I need.